← What’s a Volunteer Naturalist? Week 13, three months into the challenge to eat at least once a week with locally sourced items. All of the main ingredients for dinner came from less than 150 miles of our house. A few exceptions, spices and oils/vinegar, as noted when I started this personal challenge. This week I challenged myself to cook items new to me for cooking, but not new from experience in restaurants. Bison, from Gunpowder Bison, and bought at the Silver Spring Year Round Farmer’s Market. Short Ribs, slow cooked in the oven. 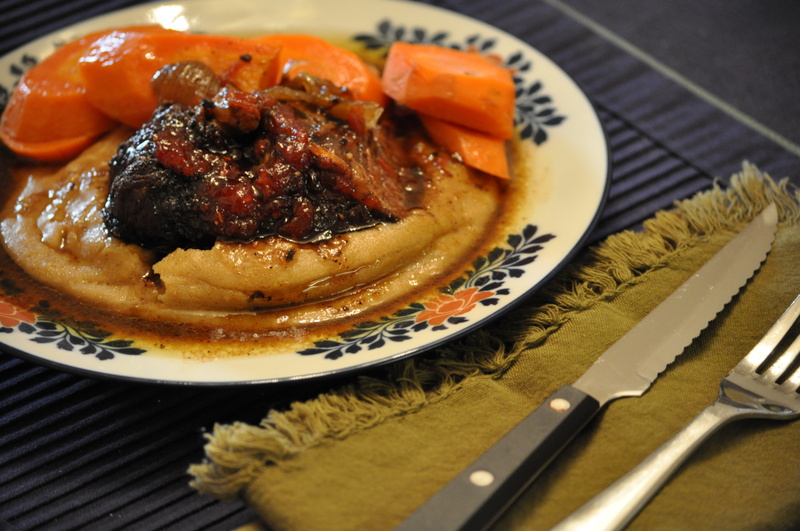 Served over soft creamy polenta and with honey glazed carrots. The bison was first rubbed with “RubJoeMeat” coffee based dry rub bought last year at one of the local home shows. It is not local, obviously, but perfect for bison. Then, I placed it in an olive oil rubbed shallow pan, added red wine, balsamic vinegar, sliced white onion, and spread some McCutcheon’s tomato preserves over the top. Salt, pepper and cayenne. Baked at 225 degrees for three hours. 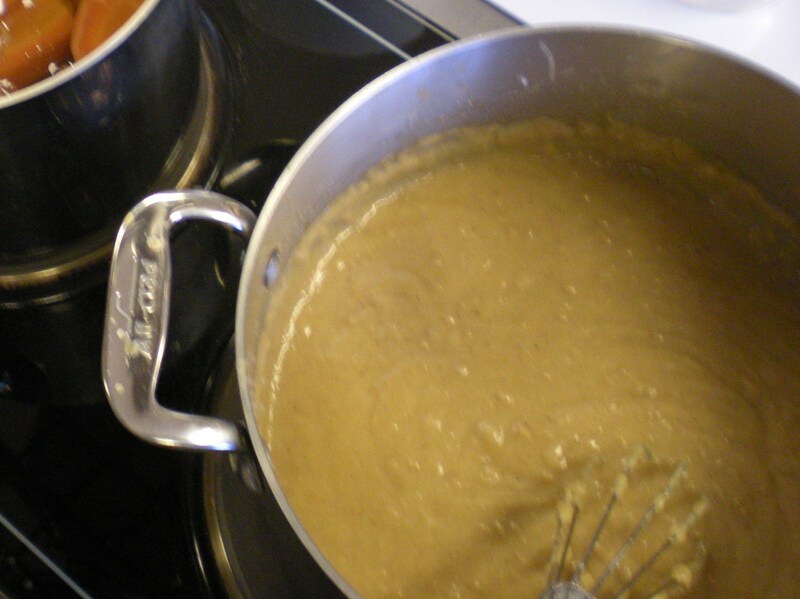 The polenta was made using Burnt Cabins roasted cornmeal. Nothing but water, cornmeal, salt, pepper and unsalted butter. Also, I steamed carrots then glazed them with honey. Here are the supporting ingredients that went into the meal. This was a really tasty meal. The polenta set up beautifully with an earthy quality: using roasted cornmeal created this heartier version of a soft polenta. The bison is lean, but using the wine and vinegar kept it from being dry or tough. The tomato preserves are awesome. Just tomatoes, sugar, and citric acid. Slightly sweet but still tart like tomatoes. This stuff is also great on toast for breakfast. 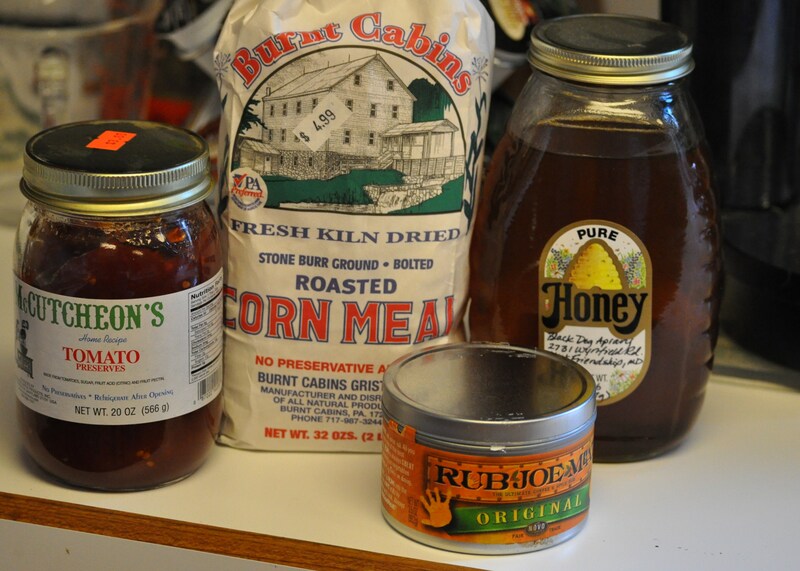 The McCutcheon Family has been in the butters, preserves, jams and jelly business in Frederick for 74 years. We can find their jars of goodness all over the area. As for the wine to stand up to this meal, we chose the 1998 Linden Hardscrabble. A fourteen year old Virginia red wine. Still with oodles of fruit and still tannic. Not brown around the edges. This wine is a killer wine and it proves that Jim Law has truly mastered the art of making big wines right here in our backyard. If you are a fan of Black Ankle and have tasted their big Crumbling Rock or Slate wines, they are babies compared to Linden. Sarah O’Brien is pushing Black Ankle in the direction that Jim Law took Linden. These are very concentrated wines. It will be interesting to see if Black Ankle can get to the level of Linden as their vines mature. I have added Jim’s notes from his web page below the picture for those who want to know more about this lovely wine, that almost but not quite upstaged my bison and polenta. Aromas: Cocoa and dried herbs, especially rosemary. 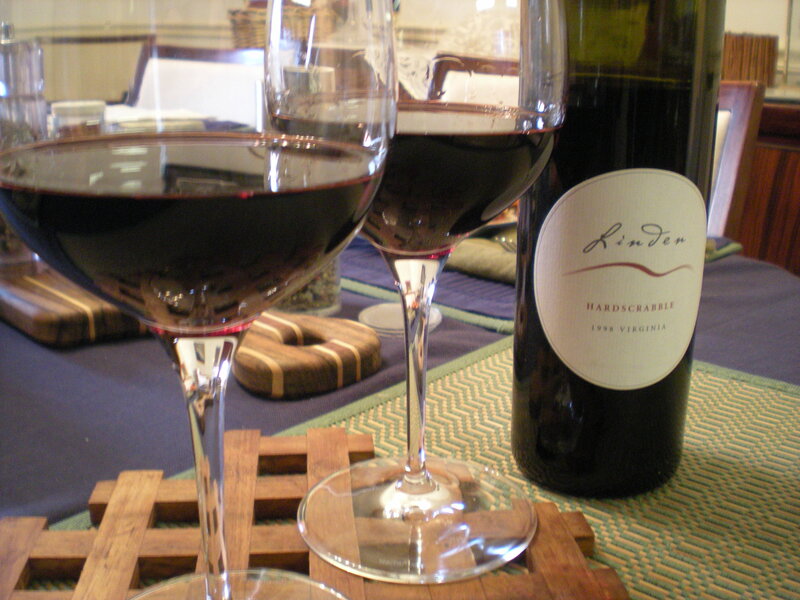 Palate: Flavors of dark cherry, cloves and black pepper with firm, yet fine grained tannins. Food Pairings: Red meats, rich cheeses, and dishes with olives or garlic. Vineyard: Estate (100% Hardscrabble Vineyard), on Blue Ridge at 1,300 to 1,400 ft. with an eastern to southern slope. Deep, well-drained mineral soils give cherry character, deep color, and good structure. Vine ages from 8 to 14 years. Vintage: 1998 was an unusually hot and dry year. A severe hail storm on June 15 reduced average yields to just 1.5 tons/acre (about 22 hectoliters per hectare). Harvest was September 22 through October 7. Winemaking: A blend of 65% Cabernet Sauvignon, 27% Cabernet Franc, 5% Petit Verdot and 3% Merlot. Grapes were destemmed and lightly crushed and fermented warm in small open bins. The cap was punched down by hand two times a day. The wine was pressed off just prior to dryness and put immediately in primarily one and two year old Virginia oak barrels. The wine was bottled after 21 months of oak ageing. 332 cases produced. Posted in Dark Days, Food, Local Businesses, Locavore, Real Food, Wine and tagged Dark Days Challenge, Linden Vineyards, local businesses, Locavore, wine. Bookmark the permalink. beautiful meal! I love the coffee rub idea. I wonder if you could make your own using locally roasted coffee. I love bison, I wish I had a good local source. I just posted a venison recipe with a coffee spice rub. It adds such a delicious flavor. I am lucky enough to have a boyfriend who loves to hunt, so I’m always after wild game recipes. Thank you for posting! This looks delicious,and I’m a huge fan of rubjoemeat and I just bought the tomato preserves last week! Can’t wait to try this!